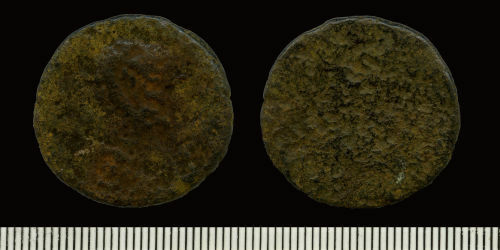 A copper-alloy dupondius, possibly of Hadrian and dating to the period AD 117 to 138 (Reece period 6). Illegible reverse type. Mint of Rome. A copper-alloy as, possibly of Hadrian and dating to the period AD 117 to 138 (Reece period 6). Illegible reverse type. Mint of Rome. Copper alloy dupondius, possibly of Hadrian, (117-138AD). Illegible. Reece period 6. Mint: Rome.